An option is a contract gives an investor the right but not the obligation to buy or sell an underlying instrument like a stock, an ETF or even n index at a predetermined price (called the strike price) for a pre-determined period of time (called the time to expiration). Buying and selling options is done in the options market, and for the vast majority of he time, that is done on an exchange. The exchange facilitates option trading contracts based on security type. While option trading can get quite complex, the reality is that there are only two types of options for the vast majority of the investing public – the call and put option. An option trader that purchases an option that allows her to buy shares at a later time is called a call option. An option that allows her to sell shares at a later time is called a put option. That’s it – option trading has two types of options. But, that’s just the beginning. Option trading is not equivalent to stock trading due to the rather large differences in the underlying securities. A share of stock represents ownership in a company whereas an option contract represents only the right to buy or share stock, or the obligation to do so for the option trader that is short an option. Futures are another type of financial derivative, and they also use contracts, like options, but the contract rules are different enough that a spectrum of risk exists between the two securities. Options allow the owner to withdraw (or walk away from) an options contract at any point. The price of the option is thus a percentage of the underlying asset or security with an entire mathematics dedicated to pricing it correctly. Contrary to information you will find on other sites, while option trading to buy an option gives the investor or trader the right to exercise that option at any point up until the expiration date – the seller has the obligation to do so if the buyer demands it. There is a massive difference between having the right to exercise an option – that is, to be a buyer than there is to have the obligation to deliver – that is, the option trading seller. Simply owning an option doesn't mean the trader actually has to exercise it at the buy/sell point. That decision is based on the price of another asset, which is why options are referred to as derivatives - their price is derived from something else. Option Trading: Why Do It? Option trading gives an investor or speculator the ability to make a leveraged bet on stock direction, or even, a leveraged bet about a stock not moving. Further, options can act as hedges for a stock position. The leveraged characteristics of an option and their hedging properties have opened up an entirely new world of trading – one that finds itself quite complex at times, and quite risky. The price at which the underlying asset can be bought or sold is called the strike price. The price paid for buying, or received for selling an option is called the option premium. While casual websites that discuss options like to promote the idea that a strike price is the directional bet of a strategy – it is not – which is to say, it may not be. For certain strategies that we cover below. The strike prices may act as a speculation for a stock not to move. We have to start with the definition from the Chicago Board Options Exchange (CBOE), but don't worry if this doesn't make any sense, after this formal description, we will explain what delta means in English. The amount by which an option's price will change for a one-point change in price by the underlying entity. * A 90-delta option will move about $0.90 for the next $1 move in stock price. * A 50-delta option will move about $0.50 for the next $1 move in stock price. * A 10-delta option will move about $0.10 for the next $1 move in stock price. Broadly speaking, 'Delta' measures how far an option is in (or out) of the money and therefore how much it will move for every $1 move in stock price. If an option has a delta near 100, it is deep in the money. If an option has a delta that is near 0, it is far out of the money. If an option has a delta near 50, it is near the money (at the money). First, on the left hand side (in yellow) we see all of the call options. Second, on the right hand side (in blue) we see all of the put options. 1. 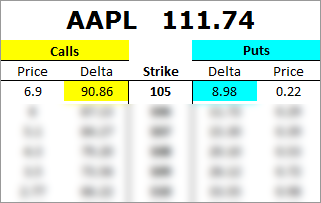 The 105 strike call option has a delta of 90.86. This number represents that the 105 call option is deep in the money. 2. The 105 strike put option has a delta of 8.98. This number represents that the 105 put option is far out of the money. Next, let's focus on the 117 strike. 1. 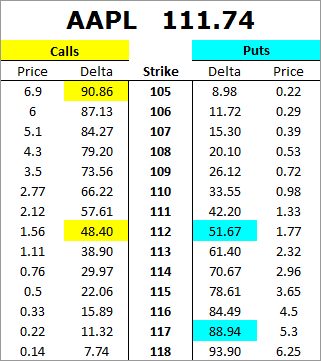 The 117 strike call option has a delta of 11.32. This number represents that the 117 call option is far out of the money. 2. 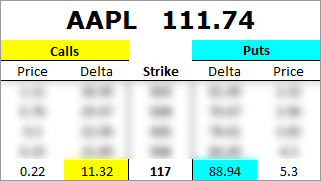 The 117 strike put option has a delta of 88.94. This number represents that the 117 put option is deep in the money. For completeness, we can look at the options that are at the money. 1. The 112 strike call option has a delta of 48.40. This number represents that the 112 call option is near the money. 2. 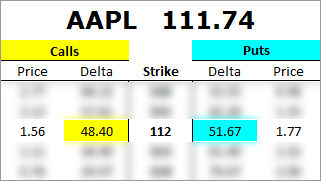 The 112 strike put option has a delta of 51.67. This number represents that the 112 put option is deep near the money. * Buying the 90 delta call (in the money) every 30-days, lost 35.6% over one-year. * Buying the 50 delta call (at the money) every 30-days, gained 10% over one-year. * Buying the 25 delta call (out of the money) every 30-days, gained 126% over one-year. (i) The back-tester looks one-year ago, and buys the appropriate delta call option (90, 50 and 25). (ii) Every 30-days, the backtester sells that call, records the profit or loss, then buys the appropriate delta call option on the new date (90, 50 and 25) again. (iii) The back-tester repeats this process for a year, trading every 30 days and then presents the results. Note: The backtester can go back as far as three-years and can trade as frequently as you desire (even weekly options) and can choose any deltas you want. Delta is roughly a measure of probability and that’s what makes option trading so magnificent. For example, a '30 delta' put should be a winner 30% of the time, or if we sold a 30 delta put, we would expect that we could have a winner 70% of the time. Now, if we can identify a trade that is priced with a 70% win-rate (for example), but find that it wins more often than that, with positive returns, then we have edge — a win that keeps winning. A call option gives the investor the right to buy a certain amount of shares (typically 100 per contract) of a certain security or commodity at a specified price (the strike price) over a certain amount of time (the time to expiration). A naked call option buyer is making a bet that the stock will rise. A call option buyer that is short stock is hedging their short position – that is, they are still betting on a stock decline, but protecting themselves against a move the other way. A naked put option buyer is making a bet that the stock will fall. A put option buyer that is long stock is hedging their long stock position – that is, they are still betting on a stock rise, but protecting themselves against a move the other way. When a put buyer already has long stock, that option trade is called a protective put, for obvious reasons. Sometimes traders buy stock and puts at the same time – that s, they purchase the stock to speculate on a gain and at the same time buy insurance. That trade is called a married put. The protective put and married put are identical option trades, it’s just the timing that gives it a fancy different name. Since options always have an expiration date, the value (measured by its price) goes down with time, all tings held equal. This phenomenon is called time decay, and the amount each option goes down each day has a measurement named after the Greek letter theta. While the idea of just two option type feels relatively well contained, once you add the reality that options can be bought long or sold short (borrowing the option and selling it), option trading takes on a whole new world of complexity. For call options, if the stock price is above the strike price, the option is called in the money. If the stock price is below the strike price, the option is called out of the money. In the rare instances where the stock price and strike price are equal, the option is called in the money. And, since we are covering jargon, if the stock price is close to the strike price, that option is said to be near the money. That exact same scenario, but in reverse, holds for option trading put option. If the stock price is above the strike price the option is called out of the money, and so on. Since this entire document likely hasn’t read very clearly for a beginner, we can start writing in English ow that we have gone through our definitions. Call option costs $3 (jargon: the premium is $3). * At that very moment, the call option is out of the money (the stock price is below the strike price). A profit and loss image gives a clean view of this mysterious thing called a call option. * It rises in value as the stock rises. * It has a maximum loss, which is equal to the price paid for it (jargon: premium). Since each option contract usually represents the right to buy 100 shares, it’s a leveraged speculation – it gives the owner a risky investment that can lose all of its value if the stock doesn’t rise, but can yield massive percent returns if the stock does rise. While it may seem easy enough to do option trading – it turns out, it isn’t. Through all of this discussion we have not mentioned the impact of volatility on option prices, and just to make it more complex, there are actually two types of volatility, to boot. Historical volatility (HV) is easy enough – it is simply the realized volatility of a stock over a certain period of time. If “realized” feels like jargon, try this – HV is the actual volatility of a stock in the past. Implied volatility (IV) is the volatility that the option market has priced in the options for whichever time period you’re looking at. So, for example, 30-day options would have embedded in them the 30-day IV. And since that isn’t complex enough, each strike price has its own IV. So, in total, it’s quite a complex subject. We have a full dossier on this matter – pretty thoroughly analyzed – and we include just a snippet from that piece blow for ease of use. Market volatility brings opportunity, but it also shakes investors and requires a knowledge base increase. When the market goes straight up, there isn't a lot to do other than ride the trend. When the market changes its volatility regime, for option trading, that means being able to decipher the difference between various strike prices and how the pricing of those options impacts trading decisions. In option speak, that is simply called "volatility." Today we will see the impact of option skew, directly and empirically, on Apple and option trading for that security. For better or worse, it can absolutely be the difference between a profitable trade or a losing one. The difference between can be overwhelming -- say, an at-the-money straddle or an out-of-the-money strangle -- where one can lose big and the other can win big, even though the premise behind the positions is actually identical -- in this case, a bet on a big market move. Let's do it -- let's get to the next level and then see the direct impact on trading with empirical data. We start from the beginning. Volatility is often discussed as a single number. In the real world, the volatility of each strike price and in each month is different than the neighboring one. Skew is simply the volatility curve formed by plotting the individual volatilities of each strike. The shape of this curve is often referred to as the volatility "smile" or "smirk." Normally the skew forms a downward smile (or smirk) -- lower strikes have higher volatility than higher strikes. We have included a skew chart for NFLX June 2017 options as of 10-23-2015 below. First, because of a basic real-life principle about the investing world: The vast majority of the equity positions are long. This is driven by rules that govern pension funds, mutual funds, 401(K)s, and the retail public, as well as a general phenomenon that investors prefer to own securities in the expectation that they will rise in price rather than sell them in the expectation that they will decline. These realities have a direct impact on options prices (and therefore volatilities). A long investor makes two general options trades to hedge his or her long stock. The first is to purchase downside puts as insurance against a portfolio drop. This increases the demand for downside puts (the left side of that chart, above). Like all free-market prices, increases in demand create increases in price. Ceteris paribus, the only way to make an option more expensive is to raise the volatility. The second hedging trade is to sell calls against long stock (covered calls). This acts both as an income-generating strategy and as a hedge for downside moves. Call sellers imply a decrease in demand for upside calls. This decreased demand lowers prices (volatility) for the OTM calls (right hand side of the chart). The second reason a volatility skew exists is that the market moves down faster than it moves up. October and November of 2018 are exhibit 1A, where an entire year's worth of gains disappeared in a matter of weeks. Historically, bear markets are much more abrupt and realize outsized returns faster than bull markets. The more expensive OTM puts compared to OTM calls is simply a reflection by the options market that downside risk is greater than upside risk. On a side note: Remember that the stock market doesn't create new rules, it simply reflects the rules of the universe. Our universe imposes on us the reality that creation takes longer than destruction -- so bear markets (destruction of wealth) are faster and more abrupt than bull markets (creation of wealth) and option skew reflects that reality. Normally, when stocks go down, volatility (vol) goes up because investors that are long stock buy puts for protection which creates greater demand for options. Alternatively, when stocks move up, vol goes down because investors that are long stock sell OTM calls for income which creates less demand for options. For certain types of companies, the demand for upside calls is so great that the skew (vol) bends up for OTM calls as well -- this can either be speculative call buying (like a takeover rumor or earnings speculation) or a company where the upside risk is perceived to be as great as the downside (like bio-techs with a FDA decision coming). Yahoo! was a company that had been a speculative favorite for a possible buyout. We've included the YHOO skew chart for the April 2011 options below. Note how the skew for YHOO was parabolic. The downside bends up due to the phenomena presented prior. The upside skew bends up due to the order flow, which is pre-dominantly speculative call buying on takeover rumors. For the naturally curious reader, biotechs can be great examples of the second type of company -- those that exhibit an upside skew shape (the market reflects as much upside risk as downside). Here's an image of Facebook's skew, just a week before earnings were due out in 2015. Note that the highest strike prices do show elevated volatility relative to the at-the-money strikes. This phenomenon is simply a reflection that market makers are more willing to buy than to sell far OTM calls in Facebook ahead of earnings. This should not necessarily be read as an indication of a large upside move. Believe it or not, that was just a snippet. The rest of our dossier on that subject gets into why implied volatility and option skew matter to option trading. There is so much more to option trading, from time value, extrinsic value, intrinsic value, and weird terms like “moneyness.” There are the Greeks, most importantly delta. It’s just a very large subject. We hope this write up has been at least somewhat helpful and we include several long form videos in Trade Machine, our option trading backtesting application, which really get at the meat of the proposition and this wonderful world of option trading. The information contained on this site is provided for general informational purposes, as a convenience to the readers. The materials are not a substitute for obtaining professional advice from a qualified person, firm or corporation. Consult the appropriate professional advisor for more complete and current information. I am not engaged in rendering any legal or professional services by placing these general informational materials on this website. I specifically disclaims any liability, whether based in contract, tort, strict liability or otherwise, for any direct, indirect, incidental, consequential, or special damages arising out of or in any way connected with access to or use of the site, even if I have been advised of the possibility of such damages, including liability in connection with mistakes or omissions in, or delays in transmission of, information to or from the user, interruptions in telecommunications connections to the site or viruses. I make no representations or warranties about the accuracy or completeness of the information contained on this website. Any links provided to other server sites are offered as a matter of convenience and in no way are meant to imply that I endorse, sponsor, promote or am affiliated with the owners of or participants in those sites, or endorse any information contained on those sites, unless expressly stated.